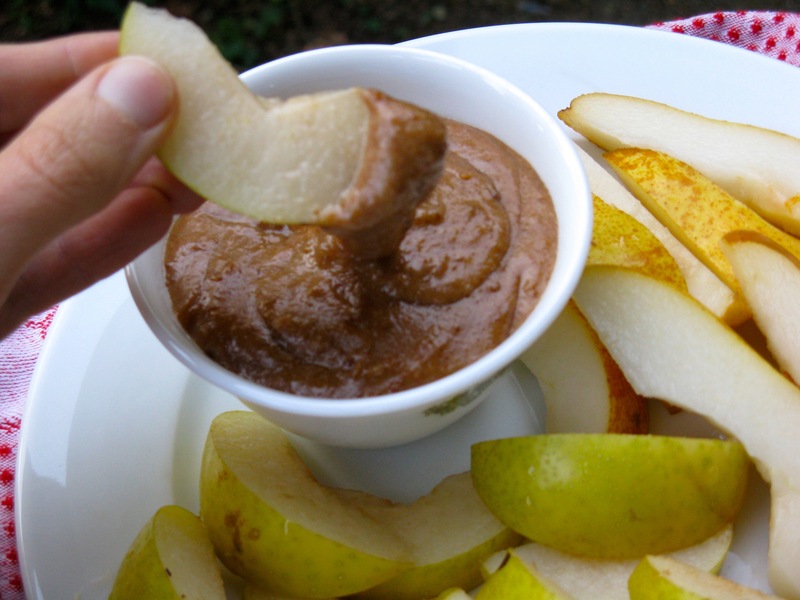 Apples and caramel are a fall classic, but one that hasn’t been in my life for many years. 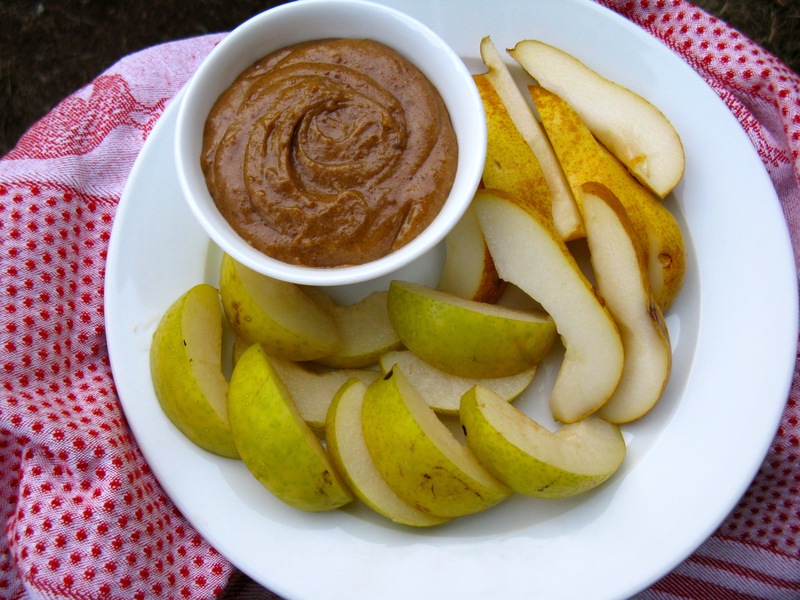 But, that’s all changed thanks to this salted almond caramel dip. Since I’ve made caramel from dates for different treat recipes, I figured it’d be easy enough to modify a bit and turn into a dip. I went slow and adjusted the the ingredients incrementally, taste-tasting each time. The taste and consistency came out perfectly and Jesse even raved about it too. It’s salty, sweet, gooey and thick. Add dates to the food processor and blend until the dates are ground up (might turn into a ball – that’s okay). If your dates are drier, soak in boiling water for 10-20 minutes before blending in the food processor. Add two tablespoons of the water and all the remaining ingredients. Process until smooth. Add in two more tablespoons of water and blend again. Add up to two additional tablespoons of water until desired consistency is reached. It should be somewhat thick, but not too thick. 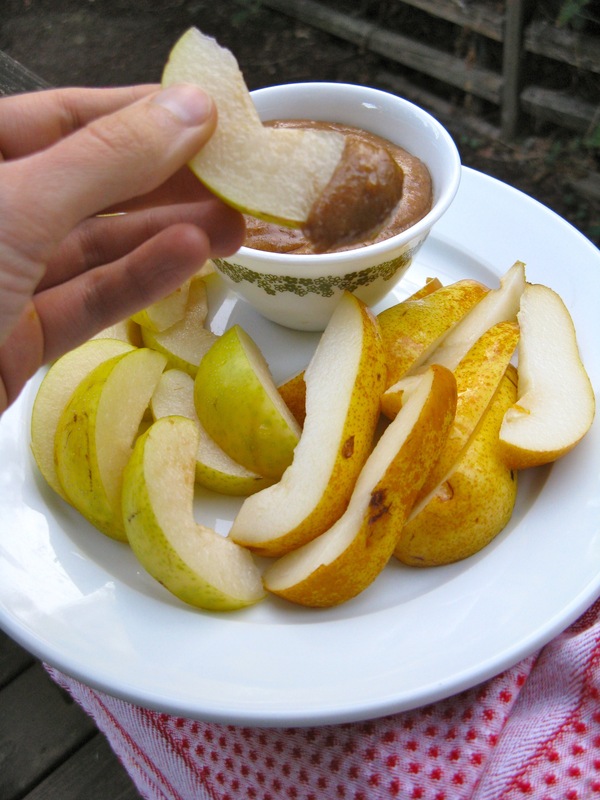 Adjust flavor to your liking and serve with sliced apples or pears. It’d be delicious spread on banana slices too. Yes, holy yum is an accurate response! Wait until you taste it (if you make it)! Sounds great! Nice fall recipe! Hey … there cave lady. 😉 Do you have a good paleo-ish crust for an idea I have for a pumpkin pie? http://beta.primal-palate.com/recipe/almond-flour-pie-crust/. It’d be good to add ground cinnamon and ginger to the pie crust too! this looks amazing! Can’t wait to try it. Nice to meet a fellow SCD-er on here since I’m fairly new to it. Thanks! It’s tasty, but a bit addictive. Pretty much any treat I make tends to be addictive though … can sometimes be a problem if you get my drift! Let me know if you ever have any questions about the SCD. I’ve been on it just over a year now. My best advice is to be patient with the process and go slow! Going to try this for Halloween, just without the butter…..
Great! Yes, you can definitely make it without the butter. I added it for a little extra richness, but it’s not necessary. WHAT!!! omg need this now! Where can I find coconut butter in Portland? Whole Foods, New Seasons, Alberta Co-op, Food Front Co-op and even Safeway. You can also buy coconut cream concentrate, which comes in a little packet inside a green box. It’s the same thing (coconut manna is the same too). Just place the packet in some hot water until it’s soft enough to poor into a jar. Whole Foods, New Seasons and Food Front carry the little box of concentrate and it’s a lot cheaper than buying a big jar.